B attle lines were being drawn, somewhere between The Beatles and Bob Dylan, with bands like Buffalo Springfield and The Byrds leading the charge in the late ‘60s. Although their breakthrough was still months away (Stephen Stills’ “For What It’s Worth”), it was clear that this Buffalo was a breed apart from the rest of the herd. The band had two talented songwriters (Stills, Neil Young), two distinctive lead guitarists (Stills and Young again) and three capable singers (including Richie Furay, who takes lead half of the time). 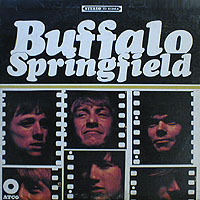 The album is split largely between Steve (side one) and Neil (side two), with Stills leaning more toward folk/blues and Young showing a real facility for psychedelic pop songs (“Flying On The Ground Is Wrong,” “Out of My Mind”). The end result is like finding The Beatles’ Rubber Soul on the bottom of cowboy boots. That’s not to suggest that Buffalo Springfield is so sure-footed as all that; there are times when The Monkees are an equally valid reference point. The social consciousness and acid wit would come with time, Stills and Young content here to write clever love songs like “Sit Down I Think I Love You” and “Do I Have To Come Right Out And Say It” (my favorite track on here). The darkest moment may be “Nowadays Clancy Can’t Even Sing,” an ambitious but not wholly effective attempt at some sort of grand statement from Young (“Broken Arrow” from their next album didn’t fare any better). 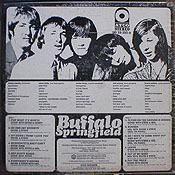 Today, the music of Buffalo Springfield is relegated to a dusty corner of the great hall of rock & roll, a somewhat blurry snapshot of music as it mutated from pop to psychedelic folk to country rock. Note that in 1971, when the album was reissued in stereo, “For What It’s Worth” replaced the opening track “Don’t Scold Me.” That track, along with the entire original mono mix, was added in a 1997 expanded reissue. © 2004 Connolly & Company. All rights reserved.